With Summer drawing near, its ripe to undertake (pun intended) a tour of Savannah's haunted spots. After enlisting a couple of intrepid ghost seeking friends, I contacted Savannah College of Art & Design painting alumnus Shannon Scott -- the former Georgia Sectional Director for The American Institute of Parapsychology, which named Savannah, "America's Most Haunted City." He was also a segment producer for the TV series "Scariest Places On Earth," which aired on Fox Family & ABC Family. He is the founder of 6th Sense World. Scott signed us up for The Midnight Tour -- offered by 6th Sense World every Friday & Saturday night from midnight til 3am and gave us directions to Clary's Cafe, which doubles as a kind of tour headquarters. When we arrived we found approximately 30 people who were busy talking with Scott and buying tour t-shirts and Scott's latest DVD, "America's Most Haunted City - Part One." The tour began in the parking lot where he explained that unlike other local ghost tours, 6th Sense World focuses primarily on personal experiences with the paranormal. He described The Midnight Tour as a "one man's journey," an accumulation of bizarre happenings from the 20 years he has lived in Savannah. His first tale incorporated a humorous slice of local history, as well as themes of demon possession, spirit photography and "bone collecting," which Scott warns is a higher level of grave robbing and the two shouldn't be confused. Next we visited Colonial Park Cemetery, where Scott told us about local voodoo rituals and practitioners. "Voodoo is history that misses the history pages," he said. He also talked about how we stood over the unmarked graves of slaves, who were buried just outside the cemetery walls during colonial times. From there we went to the Espy mansion on Abercorn Street, where tour guide Jeremiah Chapman, a film maker who has worked on the likes of HBO's John Adams, told stories of hag possession, corruption and murder. In addition, we learned that Wright and Calhoun Squares were built over large areas of unmarked graves, explaining that Savannah's reputation as "a city built on its own dead." Next we walked to The Mercer-Williams' House, which is famous for its role in "Midnight In The Garden of Good & Evil." Scott rented an apartment for 2 years from former owner, Jim Williams, the central figure of the novel and film, and Scott was interviewed by Kevin Spacey as part of the actor's preparation for the role in the movie. Scott told us details of his acquaintance with Williams, including a visit to the Mercer House and presented some theories about Williams' life and death. He also shared information not included in the book or movie that he says "cannot be printed" due to the controversial nature of it. Williams was known as an occultist and a major collector of Nazi regalia, including at one time, the ownership of the only known "SS" uniform of Adolf Hitler. For those who knew him, he was very taken by concepts like Egyptian manifest destiny and many other mystery schools of thought and types of spiritual discipline. One of the lesser known facts surrounding his life was his own ESP testing by parapsychologist, Uri Geller, who headed that department at Duke University in the early 1960s. Geller tested Jim Williams in 1961 and was very impressed by his abilities. Perhaps most notable was Williams' involvement and interest with a root doctor or witch doctor whom in the novel was dubbed, "Lady Minerva." He perceived her as an oracle and often consulted her or joined her in cemeteries where she would perform rituals on his behalf. Even believing that her work helped him gain acquittal from murder charges in 1989. Lady Minerva was a descendant of Marie Laveau of New Orleans and her family in the area still well known for their "cunjah" or conjuring work. "Minerva" passed away in 2009. The tour ended after 3am back at Clary's Cafe, where he told a final story for the few people who wanted one last morsel -- a story more chilling for its portrayal of human evil than for its paranormal aspects which is clearly another appeal of this tour. Scott is an entertaining and voluble storyteller with a strong sense of local history, legend and lore. We left after 3:30am, wishing we could listen to more of his tales. 6th Sense World's tours are walking tours, so participants should wear comfortable shoes and dress appropriately for the weather. Albeit the walk is less than a mile, and seating is available all along the tour route for those more weary at the witching hour than others. In addition to The Midnight Tour, 6th Sense World offers earlier hour ghost tours & daytime tours of local cemeteries. 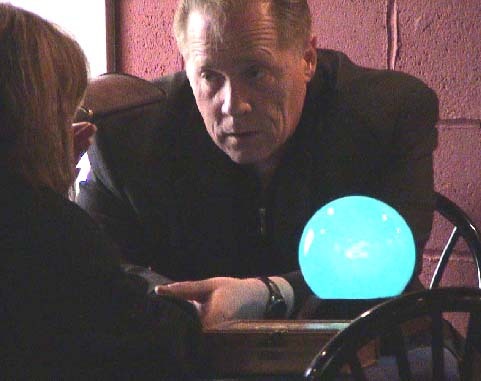 They also offer readings such as tarot, pendulum, palmistry and remote viewing services. For more information visit their website www.6thSenseWorld.com or simply Dare To Dial their number at 1-866-666-DEAD(3323).